KUCHING: His love melted her heart. Jessie Chung agreed to marry her Ipoh beau Joshua Beh after his sixth proposal. Chung is no celebrity but her wedding to Beh, an accountant, is the talk of the town and has attracted hordes of pressmen here and from Singapore. The high-profile wedding is believed to be the first of its kind in the country – the stunning bride was born a male here more than 30 years ago. Chung, whose original name was Jeffrey, underwent three major operations to become a woman three years ago. JOYOUS UNION: Chung and Beh posing for the cameras at their wedding in Kuching on Saturday night. The high-profile wedding is believed to be the first of its kind in the country. She wed her dream man at the Crowne Plaza Riverside Hotel on Saturday night. 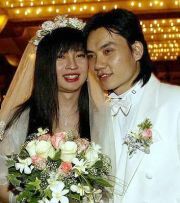 The marriage was blessed by peninsula-based Charismatic Church. Three pastors from Bountiful Harvest, Shepherd’s Centre and Assembly of Love presided over the solemn ceremony attended by some 800 relatives and friends. The couples’ parents gave their consent for Chung and Beh to tie the knot and left their signatures on the marriage documents. The couple were believed to have spent over RM1mil for the wedding, which included the purchase of a RM700,000 bungalow and a Ssangyong Chairman limousine worth RM300,000 as their bridal car. The wedding reception is said to have cost about RM200,000 while the photography cost about RM40,000. A cartoon video show entitled The Love Story (about the fairy-tale wedding of a prince and a princess) set the happy mood as the bride, wearing an exquisite designer gown, and groom made their grand entrance into the banquet hall. The guests gave them a standing ovation as press photographers and TV crews clamoured to record the event. The couple then cut a seven-tiered wedding cake and donated RM50,000 to seven organisations. The guests received gift items such as a small toy teddy bear and wedding photographs, including one in a key chain. Chung, who has released two Mandarin albums, has sung for charity and was reported to have raised some RM500,000 for orphanages, single mothers associations and other worthy organisations. A third album is said to be on the cards. Chung, who is trained in nutritional therapy, now runs a natural health farm business in Kuala Lumpur.